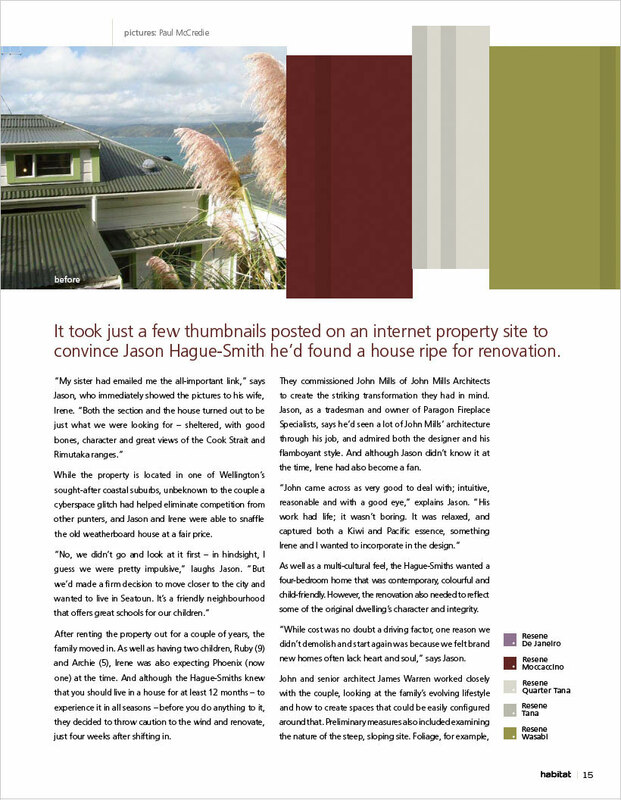 It took just a few thumbnails posted on an internet property site to convince Jason Hague-Smith he’d found a house ripe for renovation. 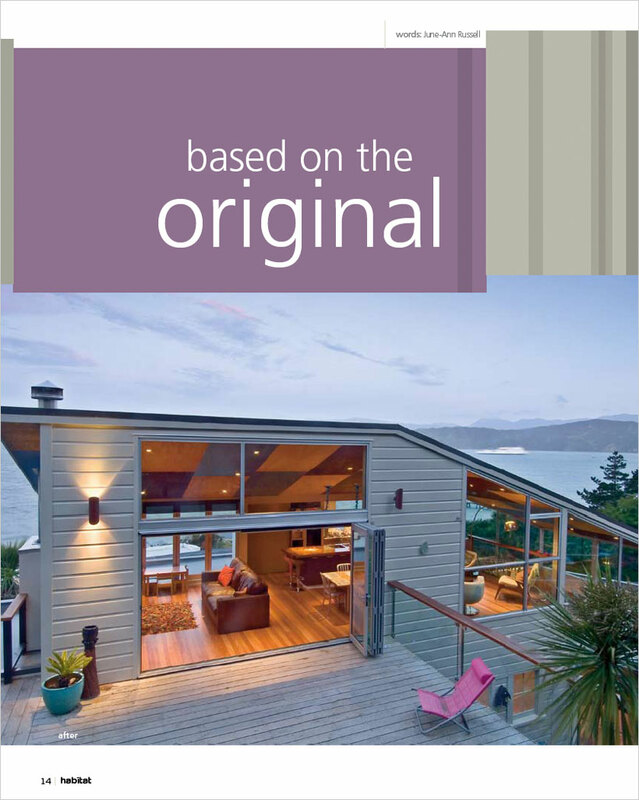 While the property is located in one of Wellington’s sought-after coastal suburbs, unbeknown to the couple a cyberspace glitch had helped eliminate competition from other punters, and Jason and Irene were able to snaffle the old weatherboard house at a fair price. After renting the property out for a couple of years, the family moved in. As well as having two children, Ruby (9) and Archie (5), Irene was also expecting Phoenix (now one) at the time. And although the Hague-Smiths knew that you should live in a house for at least 12 months – to experience it in all seasons – before you do anything to it, they decided to throw caution to the wind and renovate, just four weeks after shifting in. They commissioned John Mills of John Mills Architects to create the striking transformation they had in mind. Jason, as a tradesman and owner of Paragon Fireplace Specialists, says he’d seen a lot of John Mills’ architecture through his job, and admired both the designer and his flamboyant style. And although Jason didn’t know it at the time, Irene had also become a fan. As well as a multi-cultural feel, the Hague-Smiths wanted a four-bedroom home that was contemporary, colourful and child-friendly. However, the renovation also needed to reflect some of the original dwelling’s character and integrity. “While cost was no doubt a driving factor, one reason we didn’t demolish and start again was because we felt brand new homes often lack heart and soul,” says Jason. John and senior architect James Warren worked closely with the couple, looking at the family’s evolving lifestyle and how to create spaces that could be easily configured around that. Preliminary measures also included examining the nature of the steep, sloping site. Foliage, for example, was scrutinised to determine where the wind and sun was hitting, says James. And with the house perched at the end of a steep right-of-way, complex town planning issues meant having to work within tight parameters. “Although, this was a positive thing, in that it made us have to really think through the spaces,” he adds. Taking all this into account, the designers set out to transform the single-storey house into a striking two-level dwelling that made the most of the sunny, sheltered site and panoramic views of both the ocean and mountains beyond. Clad in weatherboard and featuring a corrugated iron roof, the original 1910 house was one level, comprising two bedrooms and an attic. Various alterations and additions had been carried out over the years, and at the onset of the renovation, these revealed shoddy workmanship and amateur DIY gone wrong. 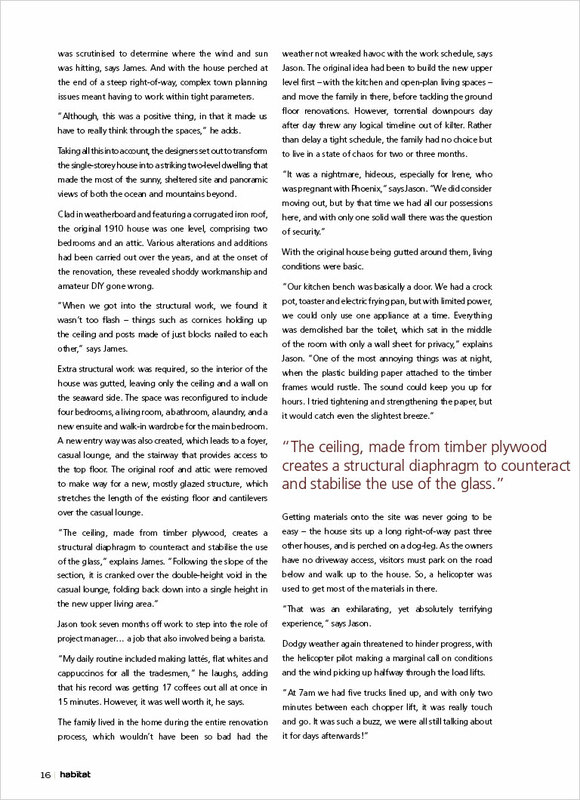 “When we got into the structural work, we found it wasn’t too flash – things such as cornices holding up the ceiling and posts made of just blocks nailed to each other,” says James. Extra structural work was required, so the interior of the house was gutted, leaving only the ceiling and a wall on the seaward side. The space was reconfigured to include four bedrooms, a living room, a bathroom, a laundry, and a new ensuite and walk-in wardrobe for the main bedroom. A new entry way was also created, which leads to a foyer, casual lounge, and the stairway that provides access to the top floor. The original roof and attic were removed to make way for a new, mostly glazed structure, which stretches the length of the existing floor and cantilevers over the casual lounge. Jason took seven months off work to step into the role of project manager… a job that also involved being a barista. “My daily routine included making lattés, flat whites and cappuccinos for all the tradesmen,” he laughs, adding that his record was getting 17 coffees out all at once in 15 minutes. However, it was well worth it, he says. The family lived in the home during the entire renovation process, which wouldn’t have been so bad had the weather not wreaked havoc with the work schedule, says Jason. The original idea had been to build the new upper level first – with the kitchen and open-plan living spaces – and move the family in there, before tackling the ground floor renovations. However, torrential downpours day after day threw any logical timeline out of kilter. Rather than delay a tight schedule, the family had no choice but to live in a state of chaos for two or three months. With the original house being gutted around them, living conditions were basic. Getting materials onto the site was never going to be easy – the house sits up a long right-of-way past three other houses, and is perched on a dog-leg. As the owners have no driveway access, visitors must park on the road below and walk up to the house. So, a helicopter was used to get most of the materials in there. “That was an exhilarating, yet absolutely terrifying experience,” says Jason. With 70% of the new upper level made from glass, all the glazing had to be carried onto the site by hand. This was another exercise that required precision timing and deliveries had to be carried out at certain times to minimise disruption to the neighbours. “Thankfully, they were really supportive and empathised with our difficult situation,” says Jason. The home’s dramatic presence is underlined by rich use of wood, metal, glass and colour. Rusticated cladding in a wide profile and painted in Resene Tana ensures the house recedes into its bush setting, while the weatherboards are also a salute to the character of the original homestead. The decks around the home are made from swamp totara, dredged from the Wairarapa. “It’s a wood that won’t splinter, and being environmentally friendly and chemical-free, it’s perfect for homes with children,” says the architect. A rusted steel canopy – already displaying a salt-induced patina – sits above the copper front door. Inside, saligna timber floors feature throughout. In the downstairs casual lounge, there’s a large wall painted with Resene SpaceCote Low Sheen in Resene De Janeiro; its mauvey-purple tones adding a vibrant shot of freshness, says James. Jarrah handrails add subtle warmth and colour to the staircase, also made from tongue-and-groove saligna. Two of the most distinctive features of the new upper level are the expansive kitchen and its chequered suspended ceiling. 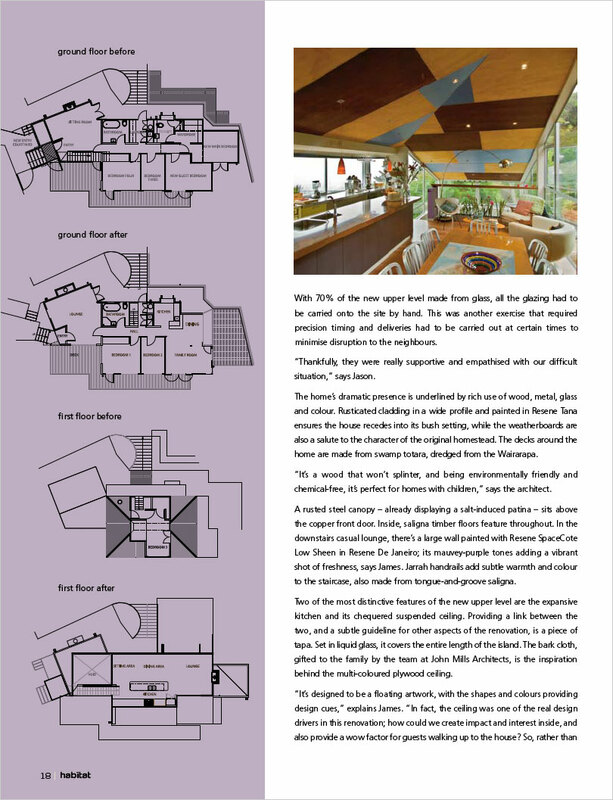 Providing a link between the two, and a subtle guideline for other aspects of the renovation, is a piece of tapa. Set in liquid glass, it covers the entire length of the island. 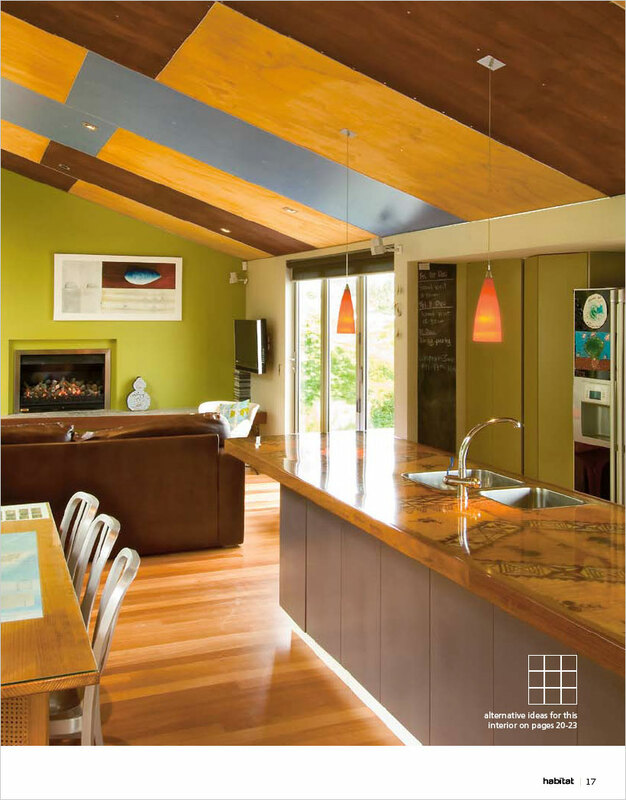 The bark cloth, gifted to the family by the team at John Mills Architects, is the inspiration behind the multi-coloured plywood ceiling. Blue and various shades of brown highlight the random shapes on the ceilings, with different gloss finishes used to bring them to life. The tapa reference is also evident in the kitchen cabinetry, which features alternating drawers painted with Resene SpaceCote Low Sheen in Resene Moccaccino and Resene Lemon Grass. And the splashes of colour don’t end there. Resene SpaceCote Low Sheen in Resene Wasabi features on the wall at the far end of the upper level. 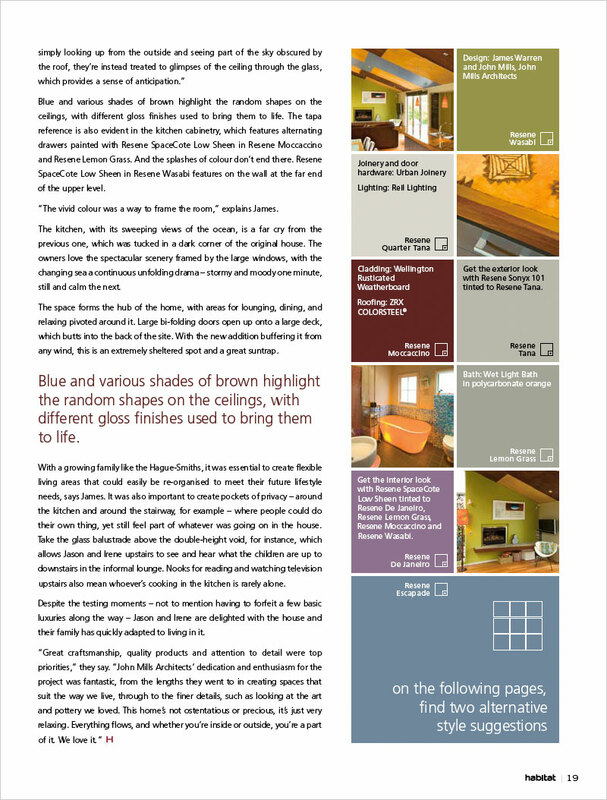 “The vivid colour was a way to frame the room,” explains James. The kitchen, with its sweeping views of the ocean, is a far cry from the previous one, which was tucked in a dark corner of the original house. The owners love the spectacular scenery framed by the large windows, with the changing sea a continuous unfolding drama – stormy and moody one minute, still and calm the next. The space forms the hub of the home, with areas for lounging, dining, and relaxing pivoted around it. Large bi-folding doors open up onto a large deck, which butts into the back of the site. With the new addition buffering it from any wind, this is an extremely sheltered spot and a great suntrap. Blue and various shades of brown highlight the random shapes on the ceilings, with different gloss finishes used to bring them to life. With a growing family like the Hague-Smiths, it was essential to create flexible living areas that could easily be re-organised to meet their future lifestyle needs, says James. It was also important to create pockets of privacy – around the kitchen and around the stairway, for example – where people could do their own thing, yet still feel part of whatever was going on in the house. Take the glass balustrade above the double-height void, for instance, which allows Jason and Irene upstairs to see and hear what the children are up to downstairs in the informal lounge. Nooks for reading and watching television upstairs also mean whoever’s cooking in the kitchen is rarely alone. Despite the testing moments – not to mention having to forfeit a few basic luxuries along the way – Jason and Irene are delighted with the house and their family has quickly adapted to living in it. A palette of light neutrals is used here to create a cool, calm, airy effect. The walls and ceiling are painted in Resene Vista White, with the kitchen cabinets finished in the same shade in Resene Lustacryl. A tufted wool floor rug adds a textural touch. To counterbalance the pale colours, the fireplace wall is painted in smoky-taupe Resene Felix. The space is further grounded by the introduction of a low daybed covered in bold brown-and-black fabric, while artwork accents the walls. To keep costs down, the existing dining table is inexpensively made over using Resene Natural Textures Wallcovering in Platinum Blonde, topped with a 10mm thick sheet of glass. The table and chair frames are repainted in Resene Double Sea Fog. touch in the dining room.